RIO DE JANEIRO, BRAZIL – The four military police officers accused of killing five youths on Sunday morning in the Rio de Janeiro suburb of Costa Barros, will await trial in jail, according to the courts. The officers are accused of killing the youths by firing more than one hundred bullets into the car they were in and then trying to change the crime scene. 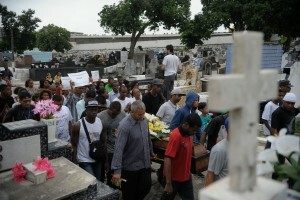 Crowd gathers to bury the five youths killed on Sunday morning by police officers in Rio de Janeiro, photo by Fernando Frazão/Agencia Brasil. “It was a brutality, cruel what they did to these five boys,” Rafael Mota Gomes, cousin of one of the victims, was quoted by Agencia Brasil as saying. “We want justice and our rights because they [police officers] can not go unpunished – stay in jail for a couple of months and then be freed to kill more black, poor youths,” added Gomes. The youths who ranged from 16 to 25 years old were childhood friends and apparently out to celebrate the sixteen-year-old’s first paycheck. After the incident the police officers changed the scene to have it look as if the youths were armed and had fired at the police. The officers, according to local media reports, placed a gun inside the car after the incident. Reports detail how the mother of one of the victims arrived at the scene to find her son still alive and begged for the officers to take him to a hospital. Allegedly, the officers refused and the youth died at the scene. Rio’s Public Security Secretary, Jose Mariano Beltrame responding to criticism about police brutality said that these four men did not represent the entire organization. “The actions are indefensible, unnecessary and exaggerated. These people have already been arrested,” said Beltrame.